Before Doug Pederson ever coached a game, back when he was still holding Brett Favre's clipboard, the former quarterback was already preparing for a career that would, over the course of a decade, take him from the high school ranks to being the next head coach of the Philadelphia Eagles. Much of his success on the sideline can be attributed to Andy Reid, the winningest coach in Eagles history. Reid gave Pederson his first shot at an NFL coaching gig in 2009 as an offensive quality control coach. Two years later, he would be promoted to quarterbacks coach. And when Reid was fired by the Eagles after the 2012, only to be hired by the Chiefs, Pederson stayed with Reid and was made his offensive coordinator in Kansas City. Now, three years later, the Eagles are expected to hire Pederson, 47, away from Reid, who went 130-93-1 in 14 seasons in Philadelphia. But that doesn't bother the Chiefs coach. Their relationship goes back much further than just coaching together, however. Reid was Pederson's position coach for two seasons in Green Bay before he was hired by Jeffrey Lurie to replace Ray Rhodes. And when Reid's Eagles opened their first season with Big Red at the helm in 1999, Pederson was his starting quarterback. 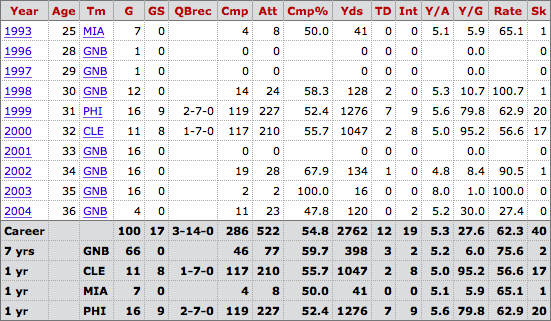 But after going 2-7, he was replaced by the team's first-round pick from that year, Donovan McNabb. The rest, as they say, is history ... or is it? Cleary, Pederson's record with the Birds wasn't going to leave a lasting impression on the then-Eagles coach. In fact, there isn't much from any point in his on-field career that would make him jump out as a future coach in the NFL. But the Packers, the team with which Pederson spent the majority of his NFL career -- and the respect Reid has for the quarterback he backed up there, Brett Favre -- would play a large role in helping Reid realize his former quarterback may have a future on the sideline. Over the summer, BJ Kissel of chiefs.com wrote a profile on Pederson, and it includes the story of when Reid first noticed the potential in his former student. It happened during a game between the Eagles and Packers, after Pederson had left Philly and returned to Green Bay. As Favre came jogging to the sideline during a stoppage of play in that particular game, Reid noticed where Favre went first, which solidified in his mind the coaching future of the now—Kansas City Chiefs offensive coordinator. “I'll tell you when I really saw it—his second stint at Green Bay,” Reid recalled of the moment he knew Pederson would be a great coach one day. “I watched (Brett) Favre come off the field and he went right to Doug. That may have been the clinching moment for Reid, but it certainly wasn't the first time he saw a future coach in the backup quarterback. In fact, according to Kissel's story, Reid noticed it back when he and Pederson were in Green Bay together. And it's a large part of the reason he brought the quarterback with him to the Eagles. After all, they had a young, talented quarterback in McNabb that he felt would benefit from Pederson's presence. McNabb was selected with the No. 2 overall pick in the 1999 NFL Draft. And now, just 12 years after his playing career came to an end -- and just eight years removed from coaching at Calvary Baptist Academy in Shreveport, La. -- it appears the Eagles finally see in Pederson what Reid saw years ago. He's poised to take over his mentor's former position, one that he occupied for nearly a decade and a half. Whether or not their relationship will translate into success for the first-time coach, however, remains to be seen.